“First of all, then, I urge that supplications, prayers, intercessions, and thanksgivings be made for all people, for kings and all who are in high positions, that we may lead a peaceful and quiet life, godly and dignified in every way. This is good, and it is pleasing in the sight of God our Savior, who desires all people to be saved and to come to the knowledge of the truth. For there is one God, and there is one mediator between God and men, the man Christ Jesus, who gave himself as a ransom for all, which is the testimony given at the proper time. For this I was appointed a preacher and an apostle (I am telling the truth, I am not lying), a teacher of the Gentiles in faith and truth. Prayer, it is such an simple yet important part of life of a follower of Jesus. It is our way to talk to God and to share with Him all that we are going through, our struggles, our blessings. It is our opportunity to confess and repent of sins that He is able to forgive (through the work of Jesus). It is our way to pray for others and their struggles and blessings. This week, let us remember to take time to pray each day. Prayer helps us grow in our faith and in our relationship with the Father. Both are animated features. Both feature young females in prominent roles. Both have great voice casts. And both are done by the best in animation (Studio Ghibli and Pixar). They both tell compelling stories and are both worth the price of admission. The differences speak to the art of animation, it’s past as well as it’s future. When Marnie Was There, being a Studio Ghibli film, is more in the traditional ink and paint animation style. Studio Ghibli has done some computer animation, they are most known for their traditional animation style (as well as telling great stories). Pixar, on the other hand, has been known for it’s cutting edge CGI animation and Inside Out shows that off. The stories the two films tell are also different in the sense of source material. Inside Out is an original IP (intellectual property), which was a staple of Pixar films in the beginning (though you can’t fault them for sequels like Toy Story 2 & Toy Story 3). When Marnie Was There is based on a book written by Joan G. Robinson. Probably the one thing that stood out to me, now having watched both films was this. When Marnie Was There is the end of an era. It has the distinction of being (as of right now) the last feature film released by Studio Ghibli. With the retirement of co-founder Hayao Miyazaki, news was released that the studio was taking a “hiatus” from feature films. If this does end up being the last Studio Ghibli film, then they went out on a high note. Inside Out, on the other hand, is the first Pixar feature film to be released in theaters in two years. Anticipation was high prior to it’s release, and it has met (and some cases exceeded expectations). Depending on how good The Good Dinosaur does come Thanksgiving, Pixar could have another resurgence. Having seen both films, I can say two things. 1) I enjoyed both of them and the stories that they told. 2) If I had to choose which one I enjoyed more, I would have to say When Marnie Was There. 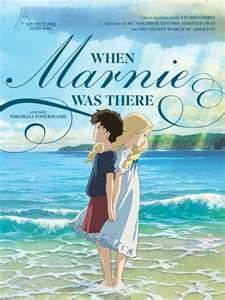 Granted I saw When Marnie Was There at the historic Belcourt Theater in Nashville and I am a huge Studio Ghibli fan, but for me that story resonated more with me. I’ll say it was a very bittersweet feeling I had watching that film know that it could be the last Studio Ghibli film I see in a theater. Those films never got the wide release in the States that other animated films get (though there were a few exceptions). Given the box office that Inside Out had its opening weekend, I’m sure you have seen it (or are planning on seeing it). But I would hope that if there is a theater in your area that’s showing When Marnie Was There that you check it out as well. Both are great films (animated or not). “Then Peter came up and said to him, “Lord, how often will my brother sin against me, and I forgive him? As many as seven times?” Jesus said to him, “I do not say to you seven times, but seventy-seven times. Forgiveness. I shared in a previous Sunday Devotional about a year or so ago on verses 21-22. I was reminded again about these verses this week with what happened with the church shooting in Charleston. The family members of the victims showed an amazing example of what forgiveness is when they forgave the shooter. That type of forgiveness comes from the Lord. Because He has forgiven us of our sins, He gives us the ability to forgive others of wrongdoing to us. Jesus, in talking to Peter and the rest of the disciples, reminded them that we are to continually forgive. We should have a heart of grace and mercy because we have been shown grace and mercy from God. As Christians, living with the Holy Spirit inside of us, we are to forgive. Jesus gave the parable of the debtor who had been forgiven much but didn’t want to forgive. Let us not be that way. Let us show forgiveness to our friends, our family, to strangers. This week, let us love one another. Let us forgive one another. Let us be a reflection of God and Jesus to this world. This is one of the most well known verses in the Bible. I remember as a kid memorizing this verse for Bible Drill. And while it is a simple verse, it is also a profound verse. It is a reminder of God’s faithfulness and our reliance on Him. Even though we may be following after Jesus, there are times when we still mess up. There are times when we fail and sin. But the awesome thing is that it doesn’t end there. If we repent and confess our sins to Jesus, he is willing and faithful to forgive us. He is willing and faithful to clean us up. It is that assurance we have as followers of Jesus that we have such a blessing. We get to have a renewed relationship with God because of who Jesus is and what He’s done. We just have to trust Him and follow after Him. But even in those times when we fail, He’s merciful and gracious to us again and again if we just repent and turn back to Him. This week, let us be mindful of that. Let us share that love with others and let them know about how God is willing to forgive sin if we are willing to repent and confess to Him our need of repentance and our need of a Savior.